The TCP Socket Lockit accessory permanently converts a fixture with a conventional medium Edison base socket into a fixture that will only accept an energy efficient lamp with a GU24 base. 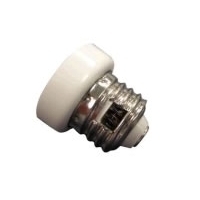 Once screwed into a socket it is impossible to remove, guaranteeing that the fixture will only accept energy efficient GU24 base lamps going forward. Note: This adapter is not rated for exterior use.